If it's Friday, it must be Offal of the Week! Brought to you by the fearless Ryan Adams, author of the blog Nose to Tail at Home, each week we highlight a different part of the animal that you've always wanted to make, but were afraid to ask your butcher for. This week: Spleen. I'm sure you've heard someone, at some point, exclaim that they were going to "vent their spleen." The saying comes from an ancient belief that the spleen was the origin of evil intentions — an idea that, unfortunately, hasn't done much for the public image of the organ. It's time to set the record straight: the spleen is versatile, delicious, and entirely devoid of evil. The spleen is more or less a massive lymph node whose jobs include cleaning the body of old red blood cells and antibody-coated bacteria. Gastronomically, it has a texture and flavor very similar to liver. For those of you who enjoy a nice slice of terrine, spleens are often slipped in and overshadowed by more prestigious ingredients. I've even heard rumors that butchers have been adding a little spleen to ground beef for quite some time due to it's deep red color — feel free to shock your friends and family with that little tidbit of info. With those probable ingestions in mind, the idea of eating it on its own is less intimidating, eh? Spleens are remarkable versatile little suckers. They can be stuffed, roasted, braised or ground finely and turned into a pâté with excellent results. Fergus Henderson has a recipe where he takes a pig's spleen, rolls it up tightly with bacon and sage leaves and then braises it in chicken stock. The whole thing is then sliced to reveal a lovely spleen/bacon spiral. Served with red onions and cornichons, it makes for a wonderful starter. The Italians like to use beef spleens in some of their crostini recipes, or in a very special sandwich. Spleens can be found at the usual haunts, a good butcher or an Asian supermarket. Lamb spleens should be ordered at Halal stores, and the beef variety at a kosher butcher go by the nom de plume miltz. 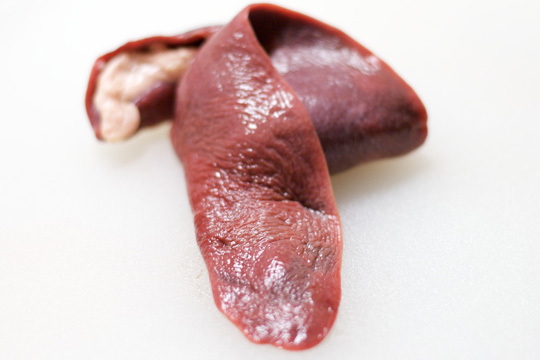 Whatever the animal, before you purchase them, make sure that the spleen has a spongy red flesh that may or may not be covered by a white membrane. The cost shouldn't remotely break the bank — my wife picked up two fresh pig spleen's for me today and the total was only ninety cents. They'll stay in your fridge for two to three days with no problems, and can be frozen for about three months but no longer.